show your gratitude and love of President George W. Bush with this high-quality bobblehead and a copy of his Best Selling book! 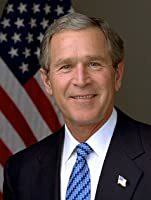 George W. Bush led our country through an extremely difficult time in our nation's history after the cowardly attacked by Islamic extremists on September 11, 2001. You can show your gratitude and love of President George W. Bush with this high-quality bobblehead in your home or office! With this gift pack, you'll also get a copy of President Bush's #1 New York Times bestseller, Portraits of Courage.